This Advent has been filled with lots of fun. I have been busy making sure that each day brings a little something fabulous to the lives of the Lil Divas. Today, I am sharing our Mini Gingerbread Houses with you. Cute, right? Well these adorable little gingerbread houses have a story behind them. It's the story that I'd really like to share with you today more than the activity itself. Over the weekend, I set out to have the most fabulous gingerbread house making experience with the Lil Divas that we have ever had. Talk about putting pressure on myself! I was determined to make them from scratch. Who needs a kit? Not me! Yeah, right! It was a disaster! Three attempts at dough and three separate frantic runs to the store later - I was feeling defeated. I couldn't get past mixing the dough. As a matter of fact, it wasn't dough - it was slop! I don't know if it was the horrible humidity that day here in South FL or if it just wasn't meant to be but I followed the recipe precisely and it amounted to failed dough. Then I tried not one but two of those packaged dough mixes. Can you guess what my results were? Yes, FAILURE! I felt horrible, like I had failed the Lil Divas. Except, I was the only one that felt way. The Lil Divas were beyond excited to sit and decorate their mini gingerbread houses. Yes, mini - I bought the wrong kit! Seriously, at that point I could do nothing else but laugh. But, it actually worked out great. They were the perfect size for the Lil Divas. They did not care that the gingerbread was store bought. They did not care that it was the wrong size. They did not care that we had flushed globs of dough down the toilet. They embraced the moment. They happily sat and decorated their houses, taking great pride in which candy went where. There was lots of giggling, decorating and of course candy sampling. I do not have to be SUPERMOM. I do not have to do it all from scratch. I do not have to do it all perfectly. I merely have to allow myself to enjoy the moment. To be present, to embrace the opportunity I've been given to make these memories with the Lil Divas. To simply have fun decorating gingerbread houses with my daughters. In the end, isn't that what this is all about? These are GORGEOUS! 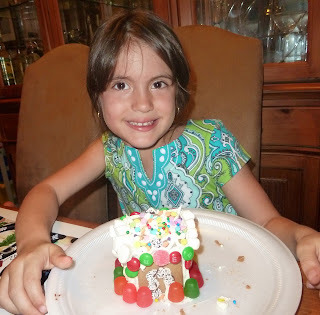 Love the idea of mini gingerbread houses... much easier to manage and each child can have one. Wow! What perfect gingerbread houses! :) Your girls did such a great job! I love their houses very much! And you are lovely to be so honest, just what we need for the creative christmas countdown!! I buy kits. I don't think I am even up for mini ones. Yours are super cute! I love them and yeah to admitting we're not super mum. I'm making mince pies with J this afternoon (an English tradition) and cause of time I've brought ready rolled pastry but I will love the fact that we can have fun cutting out shapes and filling the pies with the mince. Thank you so much for sharing this!!! It is a great reminder! The experience is what counts not the "perfection" in the moment! Bern, That's a good message! we need not be super moms! The kids enjoy every moment of togetherness and fun! It sounds like exactly what happens at my house. I think the kids now days are so understanding! They understand the effort that goes in and they don't crib! I love this post. Like Cathy said, it's about having fun with your kids. That's exactly what this post is about! If you didn't tell us the story and you didn't tell us you bought kits, we would have never known, the faces on those girls shows they had a wonderful time! Great post! I love these mini gingerbread houses. Perfect for the little girls. Loved reading your honest story behind it. I so admire your love for your daughters and your persistence. I right now want to hug you for your mommy love, Bern :) You are such a lovely mother and so genuine a person! Big hugs to all three of you - lovely divas! 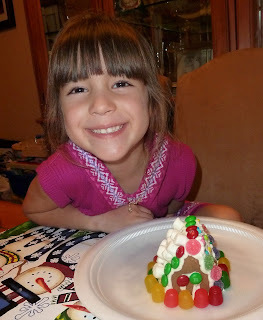 We made gingerbread houses - it was my very first time to try them and I am not so sure I used the best materials because my candies were all falling off:) But the children loved the process!! I made the dough yesterday. I'm hoping I don't have to send it down the toilet! LOL! Thanks for the great post. I will take your message to heart and just go with the flow! Hats off to you for trying, Bern. I've never even attempted a ginger house from scratch! For 13 years, we've done the annual tradition - with a kit. I actually think the mini's are better. No arguing when each child has his or her own house to decorate! Good work, they're beautiful, and it looks like the girls had a blast! Love your story. Your girls and the mini ginger bread houses are precious. Thanks for sharing. Love this story! No we don't have to be "super mom".... but you are definitely a "super" mom for providing your the little divas with such a wonderful experience. Oh I love these! So adorable! What a great lesson for mom. And it looks like a lot of fun for the kids! They probably loved that you spent so much extra time on this project! Thanks for linking up to the Afterschool Blog Hop! This is a wonderful story. I think I'll profile it this week in my Afterschool post. Thanks for linking to Afterschool. Looks great and creative! Love the color and the idea of making the ginger house bread. They are super cute and the little houses look real!! I mean, they are very well made and resemble a real house in the snow. Also look tasty!!! Currently, I´m staying in a hotel in buenos aires since I travelled here for my vacations and they have a bakery inside the place that prepares delikatessen for guests. I will ask for something like this, do you say they are gonna be able to make them? You deserved to be happy. Have a lot of fun. Wow, girls are so cute! They are rel divas) I really like your blog and it's so nice to see they way you love and take care of your kids. My best friend has recently born a baby and I'll give her an advice to visit this blog, there are so many useful advices for parents.